This week is National Breakfast Week and a celebration of all things breakfast. Usually I am quite cynical about national-this-that-and-the-other weeks and days, there always seem to be several running at the same time and the number of designated weeks and days is now beyond the ridiculous. At one stage last year I joked that I was eating a doughnut, sipping a martini whilst wearing my pajamas in order to keep up. However I think that breakfast is important meal (I have been running a breakfast event on this site for some years), and breakfast week is run by the Agricultural and Horticultural Development Board, whose aim is to make British agriculture and horticulture industries more competitive and sustainable. I cannot argue or be cynical about those aims. Many people miss breakfast each day. There is an increasing need for breakfast clubs in schools as children are going without their breakfast, sent to school hungry and unable to concentrate and learn. There is nothing like a full English breakfast, although it is usually a treat reserved for the weekend. With the addition of a sheet of puff pastry I have turned it into a tarte tatin, which you can leave to cook for 20 mins whilst you shower, read the papers, drink coffee or go back to bed. You can cook your choice of fillings the night before and assemble this in the morning, next time I shall add some black pudding. 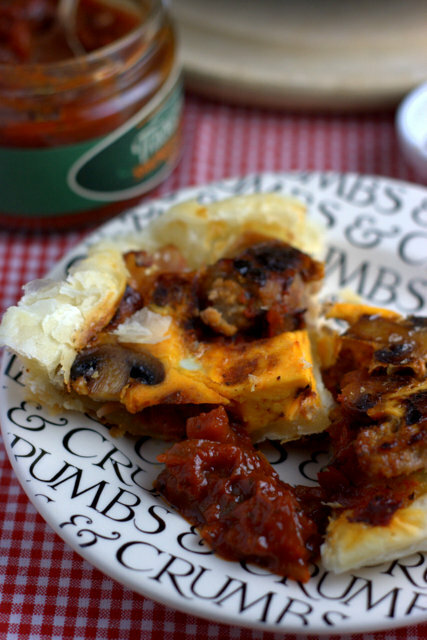 I nearly always use ready-made puff pastry, quality varies try to buy one containing butter. 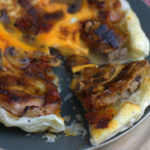 If you try this Recipe: Full English Breakfast Tarte Tatin please tag #FussFreeFlavours on Instagram or Twitter. It is amazing for me when for me when you make one of my recipes and I really do love to see them. You can also share it on my Facebook page. Please pin this recipe to Pinterest too! Thanks for reading Fuss Free Flavours! Preheat the oven to 220C / 425F / GM7. Grease a 8" tarte tartin pan or oven proof frying pan well and place a circle of greaseproof paper in it. Arrange your ingredients in the pan, making two “wells” to crack the eggs into. 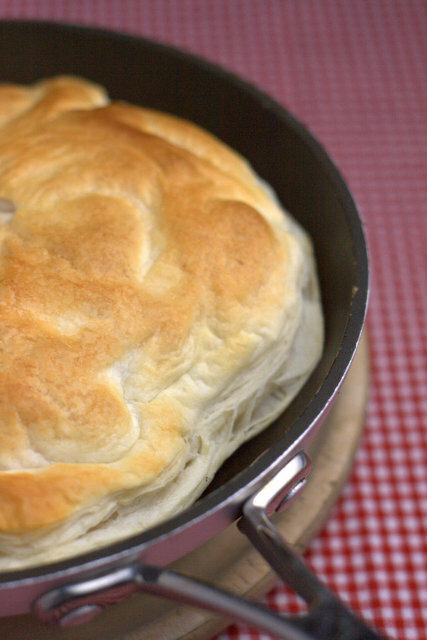 Cut a circle of puff pastry slightly larger than the diameter of the pan. Crack the eggs into the pan, immediately cover with the pastry, tucking its edges in. Allow to cool for a few minutes, place a serving plate over the pan and flip. Shake and the tarte tatin should drop out. Remove the pan and peel the sheet of greaseproof paper away if needed.